SUSPENSION, injuries and a player called away to firefighting duties just before kick-off should have been enough to end the Byron Bay season in Far North Coast Rugby Union. But a monumental effort with standout performances from prop Craig Wallace and flanker Harry Nuttall helped lead them to a 22-10 win against defending premiers Lennox Head in the minor semi-final at New Park, Kyogle. The Trojans season is now over and it will be the first time they haven't played in the grand final since 2008. They won five in a row while this is Byron Bay's first season back in first grade in a decade. Byron Bay arrived with 17 players only to have winger and goal kicker Nathan Nicholls called to firefighting duties. Captain Josh Smith missed the game because of a one-game suspension after he got his third yellow card of the season in the final round of the competition. Nuttall and Wallace both played injured with coach Warren Fisher not making any substitutions. "I haven't seen a team in my 25 years of rugby with heart like Byron Bay rugby," Fisher said. "We had the bare 16 and obviously you can't do that every week but sometimes it works in your favour." Wallace had hoped to start the game at No 8 and he came out like a bull at a gate scoring in the opening minutes playing tight-head prop. The Trojans needed to score next and they did courtesy of flanker Harry Witt. Witt was the best on the field for Lennox, a huge effort considering he played most of the reserve grade game earlier in the day. Prop Tom Gregg was next to score and reduced the margin to 12-10. It felt like the Trojans would eventually wear the opposition down and get on top but it never happened. Nuttall scored a try before five-eighth George Hitching kicked a penalty goal late in the game to give them a 10-point buffer. "Harry was at Lismore hospital getting a cortisone injection into his shoulder 30 minutes before the game so he could play," Fisher said. "The physio told him he probably shouldn't have played so the players didn't have to look much further than each other for inspiration." Meanwhile, regular season runners-up Wollongbar Alstonville sprang a surprise in yesterday's major semi-final. 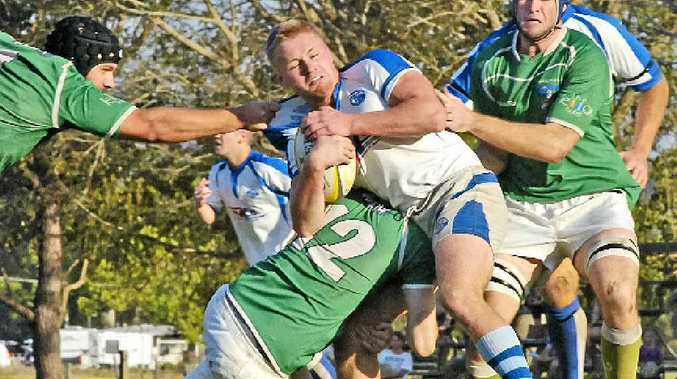 The men from Lyle Park secured an excellent 38-17 win over minor premiers Lismore City. Despite having home advantage, the Greens had no answer to a powerful display from their opponents. City will at least get a second shot at a grand final berth when it takes on Byron Bay in the minor final.